Start at least six months and as much as 18 months ahead. The more complicated the reunion, the more planning time it takes. 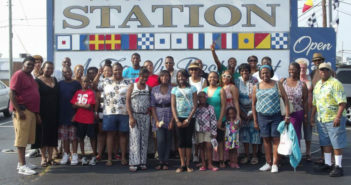 Family members need time to plan vacation time off from work and to save their money to attend. Don’t try to do it all yourself. It’s a FAMILY reunion so get the family involved! Draw on strengths. Does your aunt love to cook? She can organize the food. A travel whiz can find a destination, reserve rooms and help people get there. A reunion can be an afternoon or a week. It can be informal or a cruise or destination reunion. Find out what family members can afford and how much time is ideal. Some family members will want to just hang out and talk and reminisce or look at old photos. Others want to play games or go for a hike or a movie. Allow for some spontaneity. 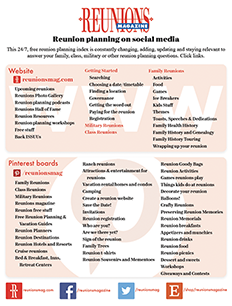 Adults plan reunions, so they plan things they want to do. Remember that kids may not know other family members, so plan fun activities. 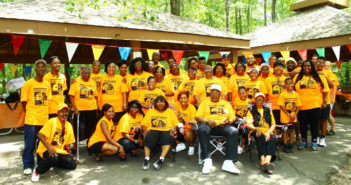 They will remember how much fun they had and that will motivate them to attend future reunions. Use technology to keep people posted and get them excited as the reunion draws near. Send teasers and updates. Create a family website to post details, photos and family history updates. Hire a caterer if you don’t have time to coordinate food. Charter a bus. Hire professional entertainers. And for more complicated reunions, hire an event planner. 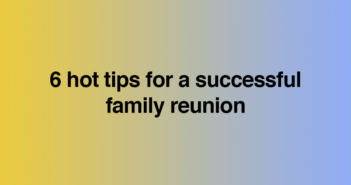 Reunions are a fabulous opportunity to interview family members about their lives and family history. Make your own videos. Take photos. Or hire a personal historian (find one at personalhistorians.org) to create a legacy project that can be shared with future generations. From an AARP blog by Amy Goyer.